Wittenoom, the name strikes fear into the hearts of people in Western Australia (WA). For decades, the Wittenoom mine operated by the Australian multinational CSR (Colonial Sugar Refinery) and its subsidiary Australian Blue Asbestos produced a huge tonnage of crocidolite (blue) asbestos. It also produced Australia's greatest industrial catastrophe. Despite knowing what exposure to blue asbestos could do to human beings, the mine owners allowed deadly practices and unsafe working conditions to persist in its mining and milling operations, and even in the town of Wittenoom itself, by allowing contaminated mine tailings to be used throughout the township in both public and private projects. From the early 1940s until the mine closed in 1966, more than 20,000 people have lived in Wittenoom, amongst which were 4000+ children. It is believed that 10% of Wittenoom's residents (2,000) have died of asbestos-related diseases such as mesothelioma, asbestosis and lung cancer. Derryn Carnaby, whose family lived in Wittenoom, lost both her parents and two brothers to the asbestos cancer, mesothelioma. Although Derryn was born after her family had left Wittenoom she has serious concerns about the health of her sister Maggie, pictured below, and other Wittenoom residents. Maggie Lewis, Laurie Kazan-Allen and Derryn Carnaby. Derryn, a determined and proactive lady, translated her desire to do something to help the Wittenoom kids into a plan. With the backing of her family and friends, Derryn approached the Asbestos Diseases Society of Australia (ADSA), of which she is a stalwart member, with a proposal for a sponsored walk from Kalgoorlie to Perth to raise funds for research into asbestos-related diseases; the most significant way to help those whose lungs already contain the deadly fibers is to find a cure! The gruelling 600 km trek from Kalgoorlie to Perth will be accomplished by 2-person teams of walkers starting at staggered positions over each daily leg of the journey. In this way, every meter of the way will be impacted by at least two pairs of ADSA feet, sore feet no doubt. Bev Bertocchi has been in training for weeks; her husband Steve, a Wittenoom kid, died of mesothelioma in September 2009; two years earlier, his mother Lucia had died of the same disease. Bev is hoping to raise public awareness of the epidemic of asbestos-related disease while at the same time encouraging donations for the ADSA research project. 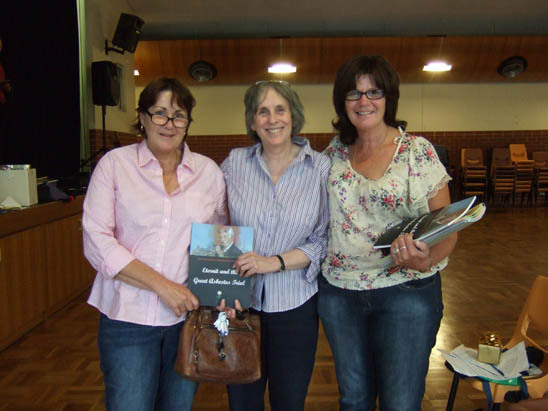 I had the privilege of speaking to ADSA Executive Officer Rose Marie Vojakovic, Derryn Carnaby and Bev Bertocchi about their motivation for the walk and their feelings about their country's asbestos heritage when I was in Perth last month. Their enthusiasm was infectious and their determination to see this event through to its end inspiring, as can be seen in their off-the-cuff remarks in the impromptu mobile-phone recordings (see links below) I made at the time. The logistical planning for the activities surrounding the walk including the outreach work, the practical support, the safety precautions and the media plan required a considerable investment of time and resources, all of which the volunteers are willingly donating. There is immense support for this activity not only from the thousands of ADSA members but from the wider WA community. Towns along the walkers' route such as Merredin, Kellerberrin, Northam, Midland and Osborne Park have offered to roll out the red carpet for the volunteers and provide campsites, showers and barbecues for them as they make their way across the barren desert landscape and into the environs of the WA capital. Donations may be made to the Life Saving Wittenoom Children Account Commonwealth Bank BSB: 066140 Account Number: 1032 2106 or by sending a check made out to the Asbestos Diseases Society of Australia to PO Box 1394, Osborne Park WA 6916. If you have any queries about how best to donate you can contact the ADSA by email (at adsinc@iinet.net.au) or telephone (+61 (0)8 9344 4077). The walkers are doing what they can to save Wittenoom's Children; would you please do the same.